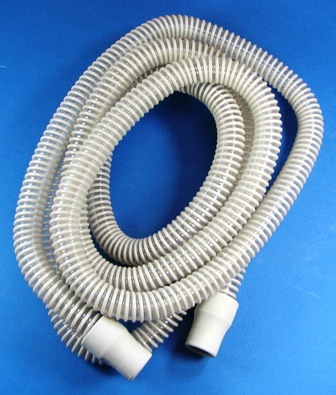 Reusable CPAP machine tubing by CareFusion. This 6-foot grey tubing is a universally-sized 22mm tube. Can be used with almost all CPAP machines. Medium weight and very flexible yet still durable, this CPAP tubing is a great replacement for your machine. Super fast shipping. Great product and best price! The hose plastic at both ends where the hose fit into the coupler TORE. The plastic, compared to previous hoses is very weak or thin. This has never happened before. I had to seal with duck tape. These are lightweight tubes which is a plus, however the thin plastic membrane is to delicate both tubes have split on the end near the face mask. I have had to tape them up just to get by. I could not recommend these to anyone who wants to get a good nights sleep. They break in the middle of the night and you hear a rushing air noise. This is much more comfortable than the heavier tubing. I was always aware of the weight of those and the drag across the bed when I turned over. It often felt like it was trying to pull the mask off my face. This is comfortable and easily adjusted out of my way. I highly recommend it. My old tube always felt in the way as the weight pulled on my mask. I don't even notice this one. Sleep is comfortable now. I am very very happy with my tubing. Thank you so very much. When I need more supplies, you will be the company I will contact. due to plastic sensitivities this is the only tubing I can tolerate - I love this company for providing it!! !